Each box contains 8 packs. Each pack contains 10 cards. Taking the Pokemon world by surprise, Necrozma has absorbed a Legendary Pokemon and taken on a new form as Ultra Necrozma-GX. Other Pokemon gather to welcome this new light...or to resist it. 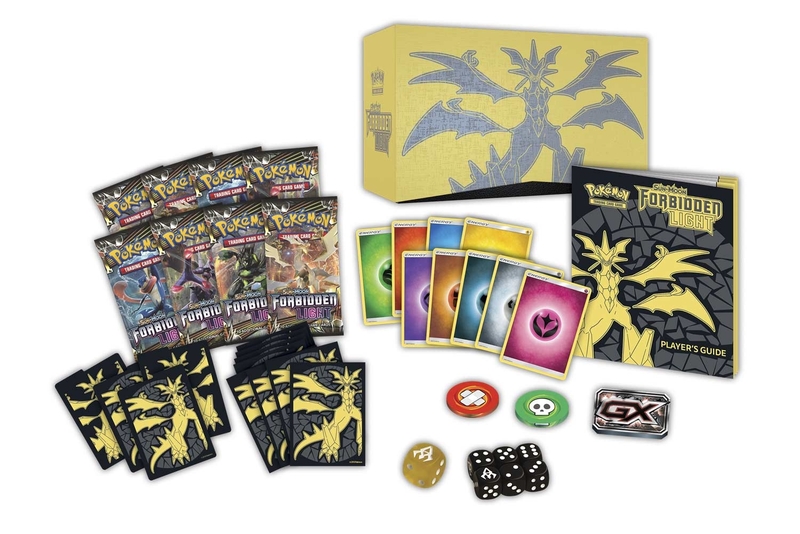 Lucario-GX, Greninja-GX, Zygarde-GX, Yveltal-GX, Naganadel-GX, even Volcanion and the majestic Arceus must choose a side. 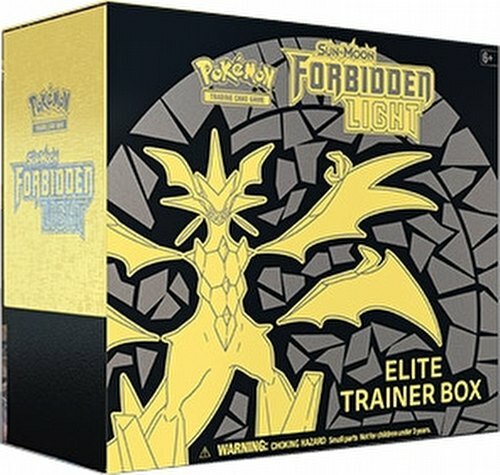 Discover awesome Pokemon and mysterious treasures in the Pokemon TCG: Sun & Moon Forbidden Light expansion. Each Elite Trainer box includes 8 Forbidden Light booster packs, 65 card sleeves featuring Ultra Necrozma, 45 Pokemon TCG energy cards, a player's guide to the Forbidden Light expansion, 6 damage-counter dice, a competition-legal coin-flip die, 2 acrylic condition markers, 1 acrylic GX marker, a collector's box to hold everything with 4 dividers, and a code card for the Pokemon Trading Card Game Online.